As our room started changing and gearing up for Christmas and the Bug Christmas Present, Santa’s Workshop, and Winter Friends. Our most exciting moments included making a Santa with our hand and decorating our Christmas Tree. Later in the month we enjoyed and awesome party with our parents and friends. We ended the month by talking about the Chinese New Year. The month of December was a very exciting month. 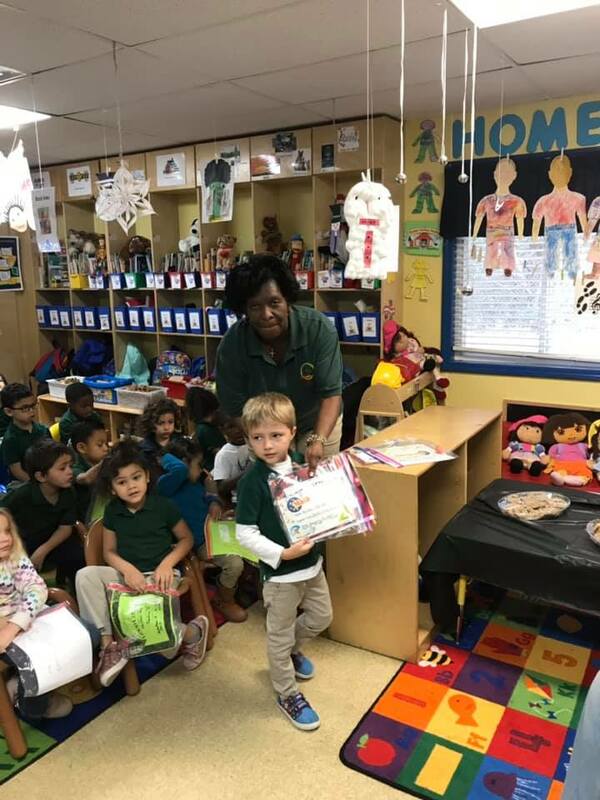 Throughout the month of December the VPK classes continued to learn and recognize shapes, letters, and numbers. We talked about Christmas Around the World and how different people celebrate and decorate for the holidays. Our December fun continued to get better the closer we got to the end of the month. We ended on a high note when Santa paid us a visit and we got to visit his WORKSHOP! We also took pictures with Santa and had a blast at our Christmas Party! Thank you to all the parents who came out and made the party a success and a lot of fun. This month we started off by getting into fall with trees and leaves. We painted them and colored them, we got the chance to paint with fall colors to decorate our classroom and halls. We hung them up for all to see. We had a lot of fun with safety. We practiced Stop, Drop and Roll. We learned about squirrels and acorns. We painted squirrels and decorated acorns with tissue paper. We even found some acorns outside and we had fun counting them and talked about their texture. This month we also learned about apples and pumpkins. Our fall festival was great fun! Thank you to all our parents who brought in items to share and those who volunteered their time to make our day special. November was a very exciting month for Pre-K. We loved learning about all the animals. We enjoyed making sheep puppets and feeling all the warm soft wool. We learned about healthy harvest foods and unhealthy foods. Eating the right foods helps us to be big and strong. We talked about being thankful and things we are thankful for. The Thanksgiving Feast was very nice and we enjoyed having our mommies and daddies here with us. This month in VPK C we learned about lots of animals and life on the farm. We read books like “Big Red Barn.” We talked about healthcare and the different types of jobs in that field. We learned about healthy exercises, and some foods that help keep us healthy. We also learned fun facts about fruits and vegetables like squash is a fruit. We talked about why its important to eat healthy. We learned about what it means to be thankful and talked about some of the things and people we are thankful for. We ended the month with our Thanksgiving Feast. It was awesome to sit with all the people we love at school and eat. THANK YOU to all the parents who came and participated.